We conducted field studies in 2009 to assess the impact of predation by Caspian terns, double-crested cormorants, and other piscivorous colonial waterbirds on juvenile salmonids in the Columbia River Basin. The Caspian tern colony on East Sand Island in the Columbia River estuary, the largest of its kind in the world, consisted of about 9,854 breeding pairs in 2009, not significantly different from 2008. The proportion of juvenile salmonids in the diet of terns nesting on East Sand Island was 37%, somewhat higher than the average percentage over the previous decade. Caspian terns nesting at the East Sand Island colony consumed about 6.4 million juvenile salmonids (95% c.i. = 5.6 – 7.2 million) in 2009, similar to the estimate in 2008. East Sand Island is also home to the largest double-crested cormorant colony in western North America, consisting of about 12,087 breeding pairs in 2009, about 10% larger than in 2008. 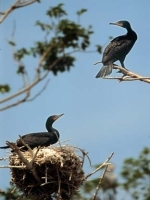 Juvenile salmonids represented about 9.2% of the diet of double-crested cormorants nesting on East Sand Island in 2009, compared with 11.4% in 2008. Double-crested cormorants nesting at this colony consumed about 11.1 million juvenile salmonids (95% c.i. = 7.7 – 14.5 million) in 2009, mostly sub-yearling Chinook salmon. In 2009, smolt consumption by double-crested cormorants nesting on East Sand Island was significantly greater than smolt consumption by Caspian terns nesting on East Sand Island. Taken together, losses of juvenile salmonids to these two species of fish-eating birds nesting on East Sand Island were 15-20 million smolts, or about 15% of all juvenile salmonids estimated to reach the estuary during the 2009 out-migration. In order to track double-crested cormorants from the East Sand Island colony during post-breeding dispersal and identify over-wintering areas, satellite tags were used to follow 39 double-crested cormorants that nested on East Sand Island during 2008 or 2009. Most satellite-tagged cormorants were tracked to over-wintering sites in either the Salish Sea region (n = 16) or the lower Columbia and Willamette rivers (n = 11), but a few cormorants roosted at sites as far north as the northern Strait of Georgia in British Columbia and as far south as the Salton Sea, CA. Only one satellite-tagged cormorant traveled east of the Cascade/Sierra Nevada range, a bird that migrated up the Columbia River to John Day Dam. These tracking data demonstrate direct connectivity between the double-crested cormorant colony at East Sand Island, which has experienced tremendous growth over the last two decades, and colonies to the north (i.e., Salish Sea region) and to the south (e.g., San Francisco Bay, CA and Salton Sea, CA) that have experienced declines over the same time period. Based on these results, double-crested cormorants from East Sand Island have the greatest connectivity with active and historical colony sites to the north in the Salish Sea region. If nesting habitat was limited on East Sand Island, most emigrants would likely search for alternative nesting habitat in the Salish Sea region. 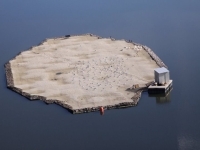 Implementation of the federal management agencies’ Caspian Tern Management Plan for the Columbia River Estuary continued, with the USACE building two new tern nesting islands prior to the 2009 nesting season. Both islands are located at Summer Lake Wildlife Area in south-central Oregon and each is a half-acre in area; one is a rock-core island and the other a floating island. Caspian terns colonized both new islands during the 2009 breeding season, eight breeding pairs on the floating island and seven pairs on the rock-core island. Five terns that had been banded in the Columbia River estuary were re-sighted at the new Summer Lake tern islands. We continued to monitor two other tern islands that were constructed by the USACE prior to the 2008 nesting season, one on Crump Lake in the Warner Valley, Oregon, and one on Fern Ridge Reservoir near Eugene, Oregon. The Crump Lake tern island attracted nearly 700 breeding pairs of Caspian terns in 2009. Eighteen terns that had been banded in the Columbia River estuary were re-sighted on Crump Lake island. The diet of Caspian terns nesting at Crump Lake and Summer Lake consisted of > 80% tui chub, a native species that is not of conservation concern. As in 2008, no Caspian terns nested on the Fern Ridge Reservoir tern island in 2009, although at least eight different Caspian terns were seen on the island late in the nesting season. Caspian terns and double-crested cormorants are also responsible for most losses of salmonid smolts to avian predators along the mid-Columbia River, specifically Caspian terns nesting on Crescent Island and double-crested cormorants nesting on Foundation Island, both in McNary Pool. The Caspian tern colony at Crescent Island consisted of 349 breeding pairs in 2009, the smallest the colony has been since monitoring commenced in 1997. Salmonid smolts represented 64% of the prey items for terns nesting on Crescent Island in 2009, similar to diet composition during 2000-2008. Based on bioenergetics calculations, consumption of juvenile salmonids by Crescent Island terns was about 360,000 smolts in 2009. The largest Caspian tern colony on the Columbia Plateau in 2009 was on Goose Island in Potholes Reservoir, where about 486 pairs nested. Data on diet composition of terns nesting at the Potholes colony were limited to smolt PIT tags recovered on the colony after the nesting season. Recovered PIT tags indicated that the numbers of juvenile salmonids from the Columbia River consumed by terns nesting at this off-river colony were surprisingly high, particularly for steelhead from the endangered Upper Columbia ESU. PIT tag recoveries on the Potholes tern colony indicated that over 15.5% of Upper Columbia steelhead passing Rock Island Dam in 2009 were consumed by Caspian terns nesting at this colony. The only active double-crested cormorant colony on the mid-Columbia River during 2009 was on Foundation Island in McNary Pool, which consisted of about 310 nesting pairs. The largest cormorant colony on the Columbia Plateau, however, consisted of about 810 pairs that nested in trees at the north end of Potholes Reservoir. Both colonies have declined somewhat over the last four years, indicating that, in the short term, the cormorant breeding population in the region is not increasing. Based on limited diet data for cormorants nesting on Foundation Island, the proportion of salmonids in the diet was similar to 2007 and 2008. Smolt PIT tag recoveries on the Foundation Island cormorant colony were also similar in 2007, 2008, and 2009. The magnitude of smolt PIT tag recoveries at the Foundation Island colony suggests that the impact of cormorants nesting at this colony on survival of juvenile salmonids is comparable to that of Caspian terns nesting at the Crescent Island colony. Stomach contents of 35 double-crested cormorants collected along the lower Snake River during the winter of 2009-10 indicated that salmonids comprised about 12.4% of the diet; most salmonids found in cormorant stomachs were from the ESA-listed run of Snake River fall Chinook. Surveys during the 2009-10 winter indicated that less than 250 cormorants over-wintered along the lower Snake River; on average, only 20% were observed at one of the four lower Snake River dams. The highest concentrations of cormorants over-wintering along the lower Snake River during 2009-10 were observed between Ice Harbor Dam and the confluence with the Columbia River. California and ring-billed gulls have nested in large numbers on islands on or near the mid-Columbia River, but these gulls have generally consumed few fish and even fewer juvenile salmonids. However, recent increases in numbers of smolt PIT tags recovered at the gull colony on Miller Rocks in The Dalles Pool, where about 4,600 pairs of gulls now nest, have raised concerns about the impact of gull predation on survival of salmonid smolts. In 2009, nearly 5,500 smolt PIT tags were deposited on the Miller Rocks colony by gulls nesting there, compared to 4,211 tags in 2008. The increase in consumption of PIT-tagged smolts by Miller Rocks gulls likely reflects both an increase in size of the gull colony (numerical response) as well as an increase in foraging intensity at nearby John Day Dam and The Dalles Dam (functional response). The magnitude of predation on salmonid smolts by Miller Rocks gulls appears to be unique among gull colonies along the mid-Columbia River.